Tobacco brown’s a nice colour, isn’t it? Definitely informal – due to its lightness and saturation – yet with a quiet sophistication. Colonial, particularly in linen, but without the baggage of cream or tan. This is 8-ounce from Scabal (801490). Ideally it would be heavier, closer to 13 ounces, but I’m willing to trade a little weight for great colour. The suit was made by Sastreria Langa, one of the tailors in Madrid I commissioned from back in July. Joaquin Fernandez is the cutter: a relatively young guy but with a lot of experience (having started at the age of 16). He is also one of the few Spanish tailors that speaks any English (the Calvo de Mora sons being the others). Joaquin is deliberately creative and broad in his technique, making both normal and shirt-shoulder jackets, and with a penchant for bright or strongly patterned linings. I avoided those with this suit – it’s not my style, and anyway the cloth has enough character on its own. Initially, Joaquin was impressive. I flew into Madrid one evening with the arrangement to be measured and fitted on several things the next day. The tailors all knew the cloth in advance, so the idea was they would measure me in the morning and cut a rough, first fitting for the afternoon. Joaquin did this flawlessly. The fundamentals of the fit were great – balance, neck, pitch etc were all spot on. We slimmed the trousers down a little and narrowed the waist on the jacket, but that was it. The second time I went to Madrid, the idea was to have a forward fitting in the morning, another in the afternoon if the tailor wanted it, and then to have the jacket sent went finished. Joaquin misunderstood, and when I arrived in the morning the whole suit was finished. To wrap up a rather long story, changing the shoulder took much longer than a day, so it wasn’t until the suit arrived in London that I saw it completed. Perhaps inevitably, the execution wasn’t ideal: the excess at the top of one sleeve was greater than the other, making the shoulder appear wider. The difference is barely noticeable now. 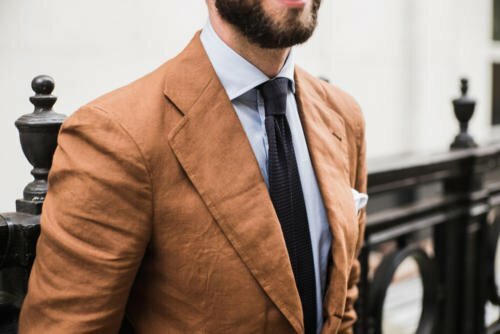 Linen is a very forgiving material, and as soon as the jacket had been worn a couple of times the sleeve wrinkled up and the discrepancy was gone. Still, that wouldn’t have happened on a worsted, and there are a couple of signs of similar lapses elsewhere. The side-straps on the trousers don’t function perfectly, and some of the finishing inside is a little rough. I love this suit, primarily for the colour. But it’s also well fitted, and given that Langa only charges €1800 (plus VAT, in Spain), with as much hand work as anything on Savile Row (though not always in the same places), it’s also extremely good value. I would just suggest a slightly less rushed fitting process, and careful attention to the details. Shoes: Edward Green Top Drawer oundles in bronze; shirt also from Langa; navy 9cm grenadine tie from Drake’s. You can follow the discussion on Linen suit from Langa, Madrid by entering your email address in the box below. You will then receive an email every time a new comment is added. These will also contain a link to a page where you can stop the alerts, and remove all of your related data from the site. That’s a lovely colour. I have some tobacco brown Fresco on the way later this year – hopefully it will look as warm and rich. I do like the full lapels on that suit as well. I think the suit looks superb on you, far more flattering than many of your other commissions (I know that isn’t the primary concern of yours when buying suits). I wondered, despite this particular tailor being good value, do you feel it’s really worth going bespoke on a linen suit? As you say, it is a forgiving material so perhaps just a good quality MTM or even off the peg would suffice? I’m thinking that the accuracy of fit that you pay for with bespoke may be lost using this material. I am curious, this is the second time that you are wearing to what the lay person looks like a poorly tied tie. I assume that as per the wedding photo is an intentional act but curious as to why you are adopting this? It’s not really a question of formal v casual, but of appearing relaxed and comfortable in one’s clothing. That’s at the heart of sprezzatura, of course, but it’s also fundamental to the very idea of elegance. Elegance implies ease. To be clear, I also don’t spend any time perfecting a rougher tie knot. I just don’t focus on creating a perfect one either. Certainly a colour I would consider for a jacket. On the subject of colour does skin tone play a factor ? Just thinking of the recent incident were President Obama wore a taupe coloured suit at a press conference. There is a small role for skin colour. Darker coloured men will always be able to pull off brighter colours, for instance, and strong red colouring works with some colours better. But overall its importance is exaggerated. I generally look best in high contrast outfits (dark suit, white shirt) when I’m a bit more tanned, but the effect is not so great that I’m not going to wear those outfits in winter. Very stylish colour, not often seen even in the south of Spain, whose terrain colours would match the cloth more than in northern countries. I also like the fit a lot. Lovely colour suit. I can’t see the issue on the shoulder myself. 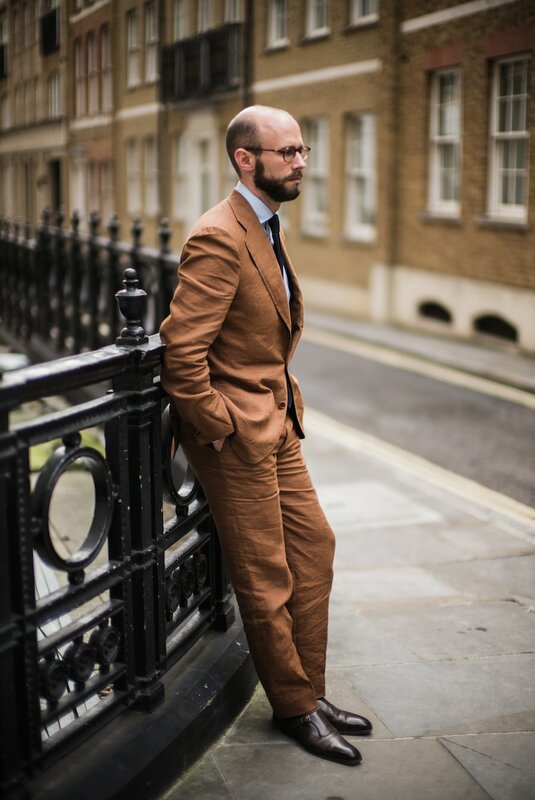 I like the idea of linen suit, but I think for myself I’d always be more tempted to go with some sort of mix so you don’t get the inevitable ‘sag’ which happens with linen. The creasing I don’t mind so much, just the saggy / baggyness that can happen after a few wears. I didn’t notice the tie knot until the comments. Doesn’t look particularly “noteworthy” to me (for good or bad) but I have to say I am not a fan of the idea of enforced sprezzatura. Anything which looks deliberately done can often look pretentious and statement seeking… Ok if you’re 20 maybe. A lot of these guys claiming they are sprezzatura personified just look clownish anywhere outside if the pitti uomo bubble (And arguably inside). Fun? Maybe. Stylish? Not so sure. Just my 2c . I love the depth of the color – and am fascinated by the texture especially in the shot of the back of the jacket (both micro – at the scale of the fabric weave scale and macro texture the wrinkles provide). Can you recall the weight of your cream linen suit? 8 oz sounds like it would be very delicate and prone to excessive wrinkling. Yes my cream linen is a W Bill one that I think was 12/13 ounce. Irish ones tend to be more in that range, with Italian ones more 8/9. Keep up the good work Simon, you are one of the best blogger out there. I must have read pretty much every one of your posts over the last two years, and many dating back prior to that. Okay. You may have some issues with fit. But it, the outfit as a whole, looks fantastic. Hi Simon, it’s nice to speak to you again after our meeting at El Aristocrata in Madrid. The back is a monstruosity, is all completely wrinkled and the fit is simply poor. Is expensive for the poor fitting. If lightweight linen didn’t wrinkle like that I’d be worried Gerald. How much does Langa charge for such a suit? Also, any plans to commission and write about NYC-tailored suits? Hey Steve – it’s on the post, 1800 euros plus VAT. No plans for NY tailors yet. There aren’t many apart from the Logsdails of this world, and of course Mark at Paul Stuart now. I’m aware of a several others scattered around, but there are very few significant houses. I think it looks great. I don’t really see what some commentators mean by complaining about the fit across the back (I sometimes wonder if some of the guys commenting on here has ever had anything made bespoke). Perhaps you could provide a photo or description of what an “ideal” jacket back should look like, for example using your favorite jacket? Sure S, though as I say it’s hard to assess that accurately in photos. Thanks Simon. I would generally be happy with the back looking more or less like in your photo, wouldn’t you? This is definitely a lovely outfit!!! 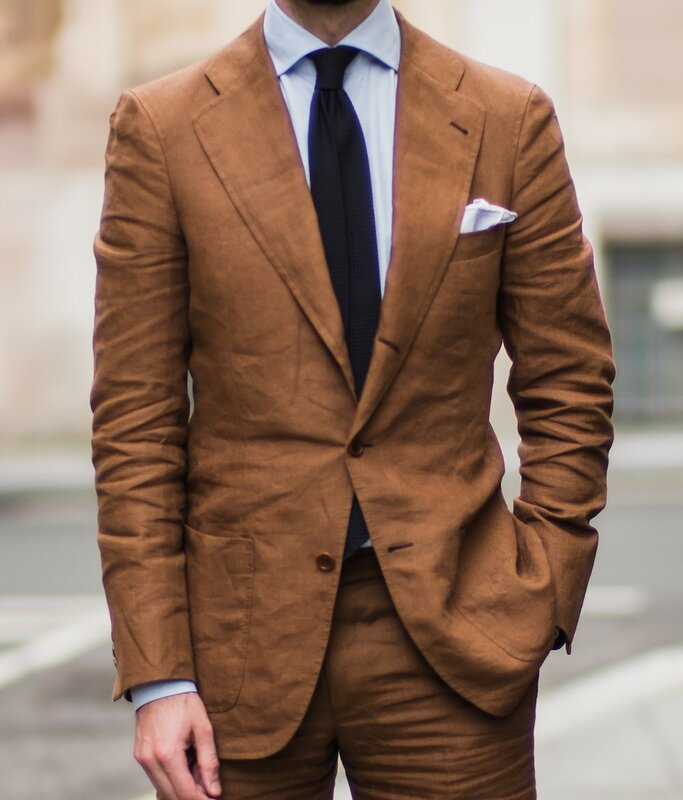 I really like that color and love the idea of a linen suit. I notice that the lapel is fairly wide and I’m curious if that was by design? Personally I prefer my lapel to be in the 3 1/4 to 3 1/2 inch range at the widest point. Would you please address the issue of appropriate lapel width? Sure Scott, I’ll do something on that at some point. Personally I prefer something around 3.5, but there’s a lot of subjective questions of taste and style involved. Isn’t that tie the unlined six fold in grenadine (grossa) one you had from drake’s? Any thoughts on using a lining versus self lining? I have been a fan of how your shirts fit, but havent been able to find a photo of you wearing your shirt without an outer layer. Pardon if i havent searched enough, but would you mind posting pictures of you wearing just your shirt both tucked and untucked? I think readers, myself included, could benefit from such a post. Thanks tremendously! If you look for the reviews I did of blue shirts (Satriano, Burgos, Segun) you can see a few examples. Looks better than any of the A & S dross you’ve posted. do you think a blue irish linen suit is a good choice for summer evenings? It could be a bit informal for evenings, but that depends a lot on context. Formalists would never blue linen at night, but if everyone else is in jeans then you’ll be easily the smartest! Seems to me like there’s quite a lot of shirt collar appearing above the jacket collar. I recall that Flusser stated that the visibility should roughly be the same as the amount of shirt cuff shown. What do you think of this? Do you think a similarly styled suit in navy fresco would work for summer, or do you think there would be a mismatch of sorts between the formality of the colour and the casualness of the jacket (three roll two, patch pockets) that would limit its wearability? Great suit! I am about to commission a tobacco brown suit in H&S 7.5 ounce mohair 286019. The color is absolutely to die for and is in my opinion, the PERFECT summer brown. I am trying to decide if I should get a casual unstructured and unlined suit in this fabric or something more formal with tons of hand work. The later being more than twice the price from my tailor. 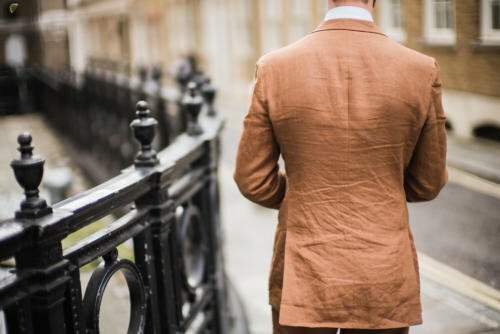 What are your thoughts on getting the most out of a tobacco brown summer fabric? I know mohair with it’s iridescent quality is quite a bit more formal than linen, but I think it could work casually as well. Personally I don’t like mohair that much outside of formal wear, but I can see the appeal too.